We discussed the structure of the harmonium in Chapter 2. The most essential part of the harmonium is a keyboard. Without the keyboard no melodies could be played. A harmonium without a keyboard is called a sruti-peti, or a “sound box.” One note is played just by pumping a sruti-peti. Look at Figure 5.1. This is a keyboard. Every harmonium has a different number of keys. The number of keys on the keyboard describes the range of the harmonium. A pitch-distance relationship can also be found. Press any key from the far right end of the harmonium. Compare that sound to any key on the far left side. You will see that the right side produced a higher pitch while the left side produced a lower pitch. A keyboard, in actuality, is a repeating series of a certain number of keys. This pattern repeats continuously. Let’s take a closer look. Figure 5.2 shows us the fundamental unit. 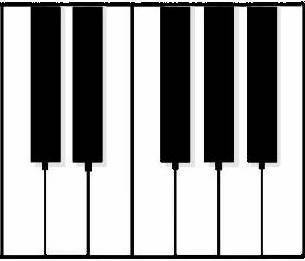 There are seven white keys and five black keys. In addition, there is a special organization of these keys. There are two black keys between the first three white keys. From the fourth white key to the seventh key, there are three black keys. This order continues over and over again. This theory will be explain in detail in the next few chapters. Take a moment and find the starting key of the unit. From here, press every key in order. Keep in mind that it is WHITE-BLACK-WHITE-BLACK-WHITE-WHITE, etc… This is the general order. Once you reached the seventh key, the “eighth” key is actually the first key in a new pattern. The first key in the second pattern is eight keys higher than the first key in the first pattern. The pattern of seven notes is called a scale. Once the seventh key is completed of the first scale, then the first key starts a new second scale. If one were to chose the fourth white key, and go one full scale higher, then one will reach the fourth white key in the next scale. The unit of measure of a full scale with eight notes is called an octave. In Western music, the octave is used because they consider the first key of a new scale to also be the last key of the old scale. In Indian music, however, the seventh key is considered to be the last and the first key is considered the start of a new scale. 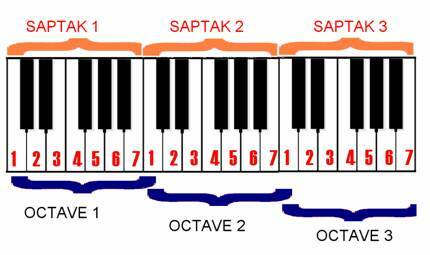 Since we have seven notes, not eight, our “octave” is properly called a “saptak.” Here is Figure 5.3 a visual demonstration of the concept of octaves and saptaks. Obviously, we won’t change saptaks every moment. We will go within the saptak, at times go below the saptak, or sometimes go above, or even do both! To describe the distance, we speak in terms of “steps.” The simplest form of a step is a “half step.” A half step is the shortest distance between two notes. For instance, the first white key and the first black key have a distance of one half-step. Be very careful! The distances from the third white to the fourth white, as well as the seventh white to the new first white, are examples of half steps too. There are no black keys between those two examples. 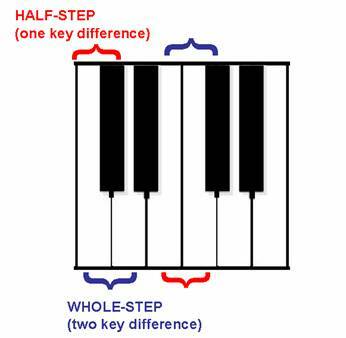 Do not assume that a half step means distance between the white key and its nearest black key or vice versa! Recall how we previously stated that as we go to the right of the keyboard, the pitches will be high. Conversely, on the left side of the keyboard, the pitches will be lower. There are three terms that refer to the relative location of the scale. The normal pitches and the main scale is known as the madhya saptak. The octave above the madhya saptak is known as the tar saptak. The octave below the madhya saptak is known as the mandara saptak. Figure 5.5 shows a keyboard’s ranges of these three types of saptaks. These facts are really nice to know, especially when communicating to other musicians musically. However, these facts alone will not help you define any pitches or keys or melodies. In order to put some sort of meaning to the notes and keys, we must know the names of the notes and sounds of the scale. The next chapter will go into the introduction of Indian music.